never disappointed in Mankell! look forward to other books by him! Henning Mankell books are always great! The entire Kurt Wallander series is wonderful, and well worth reading. I only just discovered him, and my husband and I are both reading the entire series. A police detective with amazing powers of observation and patience. I think reading the books is giving me a new perspective on how to pay attention to things around me in a way I am unused to doing. We love them! 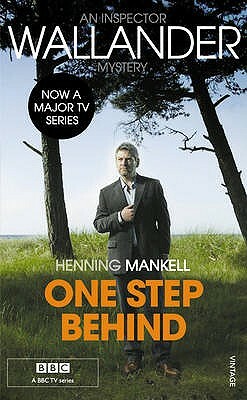 "One Step Behind" is one of the books in the Inspector Kurt Wallander series but, to be honest, because the English translations of this series have been released out of order of original publication, I haven't a clue where it belongs in the ongoing story. Having read all the books released thus far, I will say it is one of the later entries in this excellent Swedish police procedural. This is the story of the search for a serial killer who has not only coldly murdered a number of young people but one of Kurt's police comrades. It is a finite police procedural and not for someone who is looking for a page turner. Wallander and his crew endlessly go over each clue looking for a break in the case. At times I found this rather annoying and wanted to scream...."I know, I know...let's move on." In retrospect, I believe that in "One Step Behind," Mankell's aim was to give us an insight into how much work goes into a police investigation. To see Wallander pore over each lead and get into his mind as he struggles to make sense of a senseless series of murders is the joy of this book. In this book, we don't get to see as much of Kurt's angst as we have in the earlier books. He has put his personal problems on the side for the duration of the investigation and his only goal is to find the killer before he strikes again. Unlike most of Mankell's other books, there was a minimum of violence and no gruesome murder scenes. Kurt seems to have mellowed out and so has Mankell's writing.